A new beta program from leading search engine Google threatens to wipe out another opportunity for businesses to appear organically in their search results by replacing the maps listings driven by Google My Business with paid only results. Initially this test is only impacting ‘home service’ businesses such as locksmiths and plumbers, in just one region, but it wouldn’t be surprising to see the test expanded quickly to other areas. The story was broken by Dr Pete Meyers from leading Google watching firm, and marketing data platform Moz. The most alarming part of the story isn’t that the traditional pay per click ads have been replaced with a new approved supplier list of ads, but that the traditional maps listing where local businesses could be featured has been removed. This means local businesses no longer have the advantage over national chains and review sites (eg Yelp) when vying for real estate on the first page of Google, unless of course they pay Google. Notice how the free local listings dominate, and give local businesses the opportunity to rank naturally, based on their quality, reviews and profile per Google’s usual algorithm for the maps section. The local maps listing has been removed entirely – in one fell swoop eliminating the local businesses that would have featured there previously – and replaced with their new, paid listings. There are some significant benefits to consumers as Google is implementing a program of background checks, license checks, reviews and mystery shopping to ensure that users of the new paid listings are protected. Just one supplier, Pinkerton Consulting and Investigations, Inc, has been selected to perform the checks on behalf of Google at the time of writing. It will be interesting to note over coming months how the roll out of this beta program impacts the beleaguered Yelp business which suffered a significant drop in stock prices following disappointing recent results as reported by Business Insider as their listings now seem to be the first organic listings after the new paid results, instead of previously competing with the organic maps results. 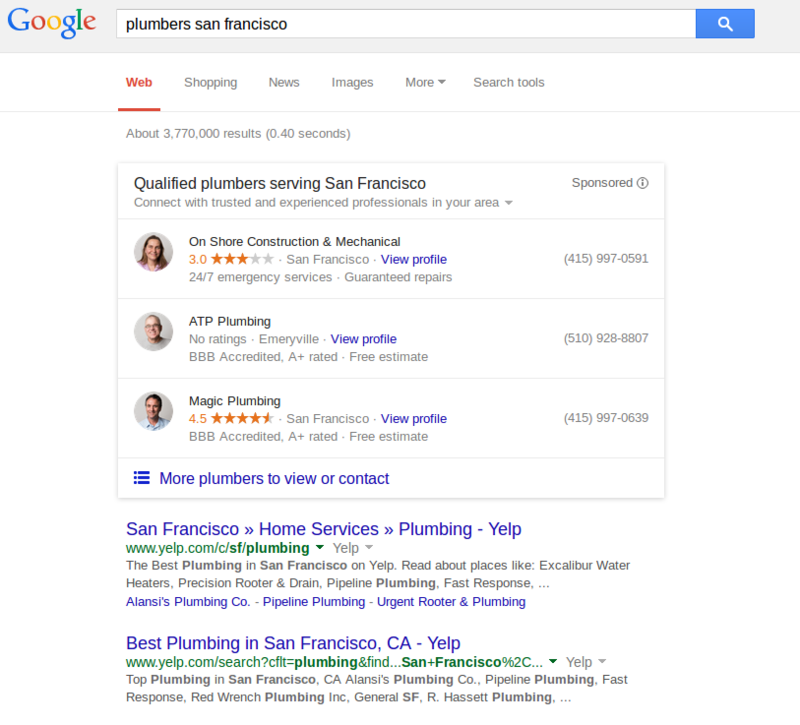 The combination of the removal of the map results, and the prominence of Yelp results after the paid listings would seem to indicate a trend towards businesses having to match a payment to Google with a strong presence on Yelp or a paid advertising presence on Yelp to maximise their customer exposure. Steve loves helping businesses grow and receive the press exposure they deserve. He does that every day as the lead consultant at palladous. He can be reached on Twitter. This is a major disadvantage to users who may want to find a specific local business or find a new service provider by reviewing ALL the choices. Competitors to Google Maps and especially Yahoo! Local should take advantage of this coming weakness and promote their more comprehensive map listings. Yahoo currently has the best local listings, but they seem not to have the will to compete effectively or don’t know how. Agreed Gail, it’s a shame to see choice being restricted when the whole purpose of search is to reveal information to users not make the decision for them. "DotComSecrets: The Underground Playbook For Growing Your Company Online..."
And in partnership with TechFunction magazine, you can get a FREE copy (you've just got to cover shipping). "A simple process that ANY company can use to geometrically improve their traffic, conversion & sales online"